SEOUL--(Korea Newswire) September 26, 2012 -- An exciting world premiere, the all-new Chevrolet Trax, a freshly styled edition of the popular Spark mini-car, and a unique ambiance characterize Chevrolet’s presence at the 2012 Paris Motor Show. The main attraction is the Chevrolet Trax, which makes its world debut. As of spring 2013, Chevrolet‘s first entry to the fast-growing small SUV segment will round out Chevrolet’s offer of capable SUVs alongside the seven-seater Captiva. Visitors also get to see the newly styled 2013 model year Spark and Chevrolet's two Youth Concepts, Code 130R and Tru140S. Located in Hall 5.2 and covering an area of 2014 square meters, the Chevrolet stand is bound to captivate football enthusiasts in particular at this year's edition of the Paris Motor Show. In the Manchester United Fan Zone, they can have their photo taken sitting in one of Manchester United’s Old Trafford dugout seats with the Chevrolet bowtie logo. On top of that, a Manchester United-themed edition of the Trax delivers a powerful interpretation of Chevrolet’s recently launched football sponsoring initiatives. 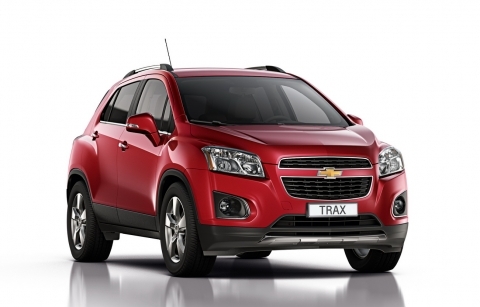 Trax is a modern, highly versatile yet fuel-efficient small SUV, offering car-like handling and all-wheel drive. It will energize the segment with its inspired styling, a choice of three fuel-efficient engines and sporty, responsive ride characteristics. Measuring 4,248 mm in length, 1,776 mm in width and 1,674 mm in height, Chevrolet's new small SUV will energize the segment with its inspired styling, a choice of three fuel-efficient engines and sporty, responsive ride characteristics. From all angles, Trax conveys athletic agility and movement. With the golden bowtie separating the upper from the lower port of its prominent front grille, the small SUV can immediately be identified as a member of the Chevrolet family. The subtle centerline crease on the hood surface and the detailed halogen headlamps add to the vehicle's dynamic appearance. While Trax‘ exterior is characterized by powerful body lines and a planted stance, engineers and designers have made sure the SUV is also aerodynamically refined. Its rearward swept roofline, a fascia-mounted air dam and an integrated roof spoiler contribute to the Trax’ aerodynamic efficiency. Wheel offerings are 16 or 18-inches in size. With sufficient space to accommodate five persons in a comfortable high seating position, Trax will deliver car-like handling while also enabling true off-road capability when needed. The engine line-up will comprise a 1.4L turbocharged gasoline unit, a 1.6L gasoline engine as well as a 1.7L diesel engine. Mated to a six-speed manual transmission, the 1.4L cranks out 140 hp (103 kW) and produces a maximum torque of 200 Nm while the 1.7L diesel engine will deliver a power output of 130 hp (96 kW), and a maximum torque of 300 Nm. Both the 1.7L diesel and the 1.4L turbo gasoline engine will also be offered with a six-speed automatic gearbox. An array of passive and active safety systems ensures that unexpected developments result in as little damage to the car's occupants as possible. Apart from a unibody structure consisting of high-strength steels, Trax will boast six standard airbags, a releasable pedal assembly and three-point seatbelts on all seats. The vehicle will come with Electronic Stability Control (ESC) including Hill Start Assist (HSA), Traction Control (TC), Anti-Lock Braking System (ABS) with Electronic Brake Distribution. Inside, Trax delivers a message of clean sophistication that is complemented by useful convenience features such as an cluster combining digital readouts with analog displays. Chevrolet ice blue backlighting is incorporated on control interfaces as well as the instrument cluster. Storage amenities in the new Trax are plentiful. They include various compartments above and on both sides of the center stack as well as an available under-seat storage tray. Trax' loading space can accommodate a maximum of 1370L; further space can be made available under the cargo floor. With Chevrolet MyLink, phone calls can be conveniently placed by selecting a name from a stored directory and then touching the call function. The system provides easy access to personal playlists, photo galleries, phone books, other stored media and data. As long as the car remains stationary, occupants may also view videos or personalized slide shows. A redesigned dual-port grille and front bumper as well as reshaped head lamp covers and fog lamps combine to give Chevrolet's popular mini-car a fresh new face. Spark also features restyled 14 and 15-inch alloy wheels that accentuate its sportier, more grown-up stance. At the rear, the center high-mounted LED stop lamp has been integrated into the spoiler above the window, resulting in improved rear visibility for the driver. Modifications carried out inside include new decor elements as well as a remodeled center console with enhanced storage. Malibu is Chevrolet's new flagship in Europe and stands out through its American style, roominess and five-star EuroNCAP safety. A diesel-powered variant of this midsized sedan can now be purchased at European dealerships. This reliable and powerful engine features high-pressure common rail fuel injection, a dual overhead camshaft, and an advanced variable geometry turbocharger with intercooler. It delivers a maximum output of 160 hp at 4,000 rpm, and 350 Nm of torque at 1,750 rpm. Zero to 100 km/h is 9.75 s for the manual transmission variant, with a top speed of 213 km/h. Reflecting buyer preferences, both the 2.0L diesel and the 2.4L gasoline engine are available with an automatic transmission. Buyers of the Orlando will appreciate the punch of a 1.4L turbo gasoline engine which will complement the 1.8L gasoline and 2.0L diesel engines already on offer. This new unit has a power output of 140 hp (103 kW) and delivers a maximum torque of 200 Nm at 1,850~4,900 rpm. 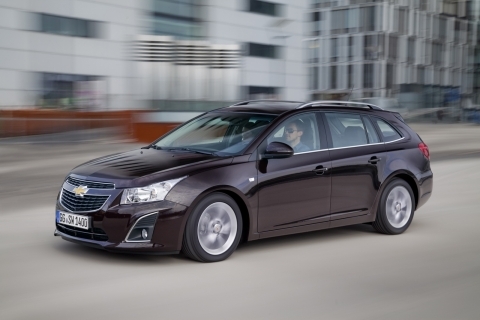 With the arrival of the Cruze station wagon at dealer showrooms across Europe, Chevrolet is offering a compact car that will particularly appeal to families and individuals with an active lifestyle. The station wagon, which complements the popular sedan and hatchback variants, is capable of accommodating up to 1,478 liters in its load space. The powertrain offer comprises a 1.4L turbo gasoline and a 1.7L diesel as well as an upgraded 2.0L diesel engine, in addition to the nameplate‘s proven 1.6L and 1.8L gasoline engines. The 1.7L diesel is the most frugal of Cruze’s engines, requiring just 4.5L/100 km. Since their world premiere at the 2012 North American International Auto Show in Detroit, Chevrolet's two Youth Concepts, Code 130R and Tru 140S, have graced several major shows with their stylish presence, including Busan, Washington, Chicago, Geneva, New York and Beijing. The 2012 Paris Motor Show offers another opportunity for car fans to view these two remarkable concepts. Code 130R and Tru 140S were designed by Nicholas David and Joe Baker from the GM North Hollywood Design Center, based on input from young people below the age of 30 across the United States. The two vehicles explore the styling and functionality this group of buyers indicated they would like to see in a new car.